Boerne, Texas has been rated by LendEDU as one of the best places in the state for starting a small business. ​By both area and population, Texas is the second largest state in the United States. The Lone Star State has the second most electoral votes in the country. There are three cities in Texas with a population above one million: Houston, San Antonio, and Dallas. Two more cities, Austin and Fort Worth, are pushing the million-person mark. That is especially true when it comes to small businesses in the Lone Star State. Bigger isn’t always better, and small businesses in Texas can attest to that motto. Every American can appreciate a small business that puts a little extra tender, lovin’ care into their products, as opposed to Walmart goods that are made on a conveyor belt. Each parameter featured a few sub-metrics that were used to calculate the total score for each parameter. Afterwords, every Texas community’s three parameter scores were summed together to get the final score. The entire process is explained further in the methodology at the bottom of this page. All data that was used in this report was licensed by LendEDU from Onboard Informatics. Onboard Informatics’ dataset includes many stand alone statistics that were used for this report, including population figures, tax data, and income projection figures. In total, over 1,000 Texas towns and cities were evaluated for this study. An arbitrary population cutoff was established at 7,500, and any community with a population below that number was eliminated from further analysis. Each town and city’s respective sub-metric score for a specific sub-category was ranked against all the other respective town’s sub-metric scores in the same sub-category on a percent scale from 0 to 100. This was done for each sub-metric. Later, each individual percent rank was multiplied by its weight to produce the point total. All of a given community’s sub-metric scores in a specific parameter were added together to get the total parameter score. All three total parameter scores were then summed together to get the final score. 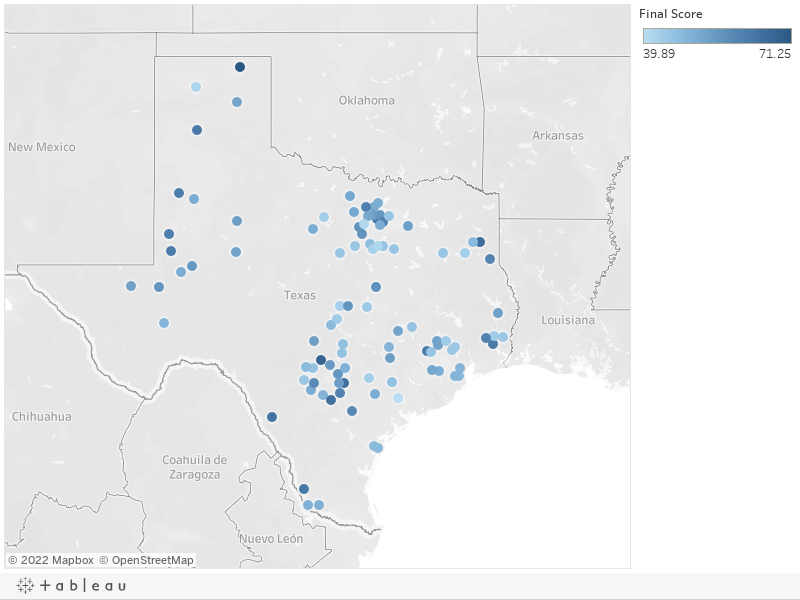 Towns and cities in Texas with a greater final score were ranked higher on the list and vice-versa.